Mumbai shares a love-hate relationship with rains. It can't live without it yet it can't stand it at times. 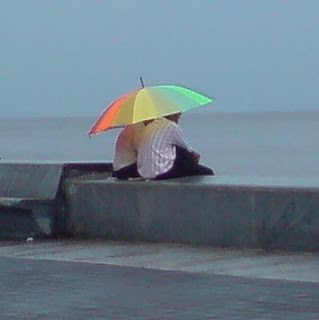 Looking at this couple sitting at Marine drive enjoying the rains may lead you to believe that Mumbai rains is all about romance. It would make you think that rains make Mumbai life colorful like the seven colors of the rainbow. True, it is fun to get wet in the rains and sipping on to a hot cup of tea while chatting with friends. Walking in the rains, splashing water on each other and listening to rain songs on radio channels can all add to the fun. However, these very rains can bring the local trains, the life line of Mumbai to a halt causing lot of inconvenience to people. The same rain that creates romantic moments could haunt people for years to come due to a nightmarish experience they had during the rains. Every monsoon there is at least one day when the rains have played spoil sport. I personally had been through one such experience on 26th of July, 2005. I think almost every citizen of Mumbai will have a tale to tell about this day. 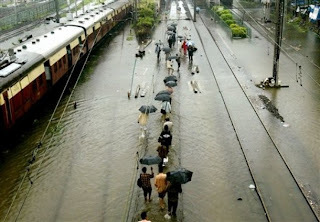 Trains were not plying due to flooded tracks and roads were blocked due to water logging. People were either stuck in office, train, bus, private vehicles or were walking and walking in the hope that they would somehow manage to reach home. From my office at Mahalaxmi I started walking with two of my colleagues towards Byculla station to check if trains were plying. Upon realizing that trains were stranded we started walking towards Dadar. We tried to find a cab but none were available. So we continued walking and reached the Eastern Express Highway. There was water everywhere. At times the water level rose above the waist. After realizing that attempting to reach home was a futile exercise, we decided to check in the nearest hotel for availability of rooms. This decision led us to Chembur. But when the whole of Mumbai was on the streets, getting a room to spend the night was a distant reality. The exhaustion caused due to walking non stop in water, literally dragging our legs, made us feel hungry. We stepped into a restaurant and had some food. The quality of the food we had was not up to the mark but then on that day we had an appetite of an elephant. After having dinner we stepped out of the restaurant. We decided to stay put and not move any further. There was a cigarette shop (Pan Tapri) nearby which was shut. We went and sat on it for a while. The seating space available was just 4'x3' and a tin sheet was nailed on to the wooden plank below. Without even realizing all three of us were dozing off as if we were sleeping in an air-conditioned hotel room on a king size bed when actually it hardly had space for 3 people to sit comfortably. Morning brought some hope. The rains had mellowed down and we started our journey again. Our aim was to reach Mankhurd somehow and from there we were pretty sure that we would manage to get some transportation to reach our respective homes. After walking some distance we reached Deonar and managed to get an auto-rickshaw till Mankhurd. The action did not end there. We were standing on the highway asking for lift. A dumper halted and we boarded it. Standing on a moving dumper was not easy. We had to hold on to the side walls at the back of the dumper. All the jerks caused when it was in motion were hurting our already aching body. We were standing and hoping that this torture would end very soon. After plying for some distance in the dumper, the rains that had taken a break decided to resume duty again. As dutiful soldiers in a war the rains started showering on us. This meant we had to open our umbrellas and at the same time hold on to the dumper so that we don't hurt ourselves. This was really tough. But before we lost our patience we reached Turbhe junction. We were relieved to know that the torturous journey had ended. From here the three of us moved in three different directions towards our respective homes. I happened to get a private bus going towards Kalwa, near Thane city. As soon as I reached Kalwa and stepped out of the bus, I got an auto-rickshaw to my home. Truly there is no place like home. The moment I stepped in, the first thing I did was to take a bath in warm water. This gave some relief to all the aches and pains. Next it was time for some hot tea to get rid of the cold feeling and a quick breakfast before I dived into my bed and dozed o ff like a cat. It was a very important day for India today. 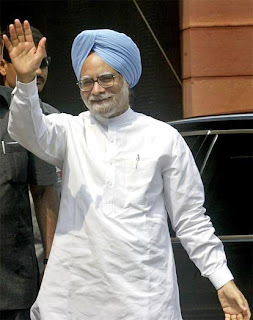 The vote of confidence was pursued by the honourable Prime Minister of India Mr. ManMohan Singh in the Parliament. He won the vote of confidence with a comfortable margin. The uncertainty prevailing over the political situation in the country due to the irresponsible Left parties no longer exists. Now India could go ahead and pursue the nuclear deal. The only regret here is the ugly situation that existed in the run up to the vote of confidence. Allegations and counter allegations of horse trading just showed how desperate the situation was for both the ruling coalition and the opposition. Yes, money would have flowed like water; incentives would have been given to lure people. However, this happens every time there is a similar situation in the parliament. I am not for or against any political party. I believe they are all in the same boat. The fact is that the nuclear deal is a necessity for the country and ManMohan Singh has taken the responsibility to ensure that the government moves forward with the formalities associated with the deal. The Left parties who had this superiority feeling due to the control that they exerted over the government are powerless now. The nuclear deal kept them in the news for few days giving them the importance that they did not deserve. They have limited vision and no wonder their existence is limited to just few states in India. I hope they will learn something positive from this outcome and try to better understand the needs of the country. They truly need to reinvent themselves or else they will become obsolete. The BJP too did not behave like a responsible opposition. I always used to believe that this political party was true to its claim of being a party with a difference. I am pretty sure that if the BJP would have been the ruling party, it would have pursued the nuclear deal. Right now they are opposing simply because they are in the opposition. I would have admired them if they would have played the role of a constructive opposition. Difficulties bring out the best in you. This holds true for our Prime Minister, Mr. ManMohan Singh. He was always targeted for being soft. This time around he rose like a Phoenix from the ashes. The current political situation helped him to emerge as a strong character. He did not bog down to the pressure of the left parties. This Singh truly is King.